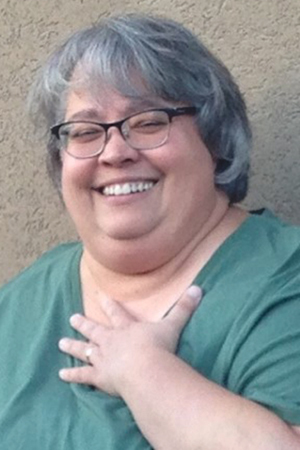 Janet Curry Romo passed away unexpectedly on Tuesday, Sept. 4, 2018, in Stansbury Park, UT. She was born in Alameda, California, on May 19, 1965, to Elaine Angus Curry and James Earl Curry, where she spent her younger years. After moving with her family to Rock Springs, Wyo., she graduated from Rock Springs High School with honors in 1983. Learning was fundamental to Janet. She earned her BA in Anthropology from Utah State University in 1997 before beginning her 20-year career with the state of Utah where she was, most recently, an Administrative Law Judge. Though this work was satisfying, it did not define her life. Family and her faith were most important to Janet, and she relished both with passion. Janet served a mission in the Tegucigalpa, Honduras/Belize area for the Church of Jesus Christ of Latter-day Saints, where she learned Spanish and gained a love for her faith. Janet married Mitch Romo in Las Vegas, Nev., on Jan. 25, 2003, and their marriage was later sealed in the Draper Temple on July 12, 2014. Janet leaves behind her husband, Mitch; her stepson, Jeremy (Ashley) Romo; stepdaughter, Michelle Romo; mother, Elaine Curry; siblings, Kristine Curry, Jeffrey (Miguel) Curry, Scott (Peter) Curry, Kaylene (James) Young, Karalyn (Robert) Woodbury, and several nieces, nephews, and friends who love her and will miss her terribly. She was preceded in death by her father, James Curry. We will remember a wife, a daughter, a sister, an aunt, and a friend who was ever present with a kind word, a welcomed deed, and a warm hug. Her legacy of care is forever in our hearts. Funeral services will be held at 11 a.m. on Saturday, Sept. 8, at the Stansbury Park South Stake Center, 240 Interlochen Lane, Stansbury Park. A viewing will be held at Tate Mortuary, 110 S. Main St., Tooele, on Friday, Sept. 7 from 6-8 p.m., and from 9-10:30 a.m. on Saturday, Sept. 8 at the Stake Center.